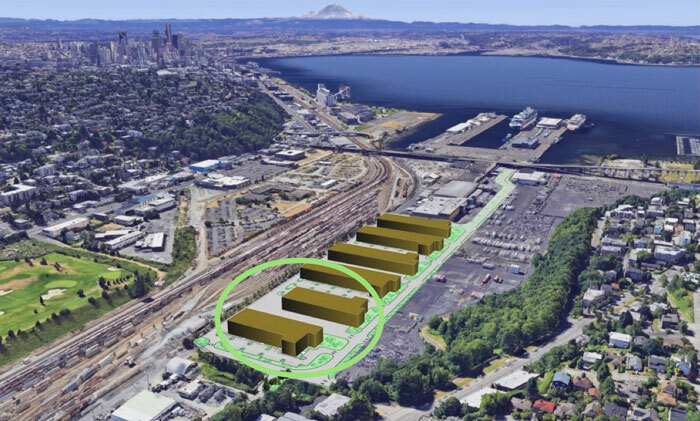 Image courtesy of Port of Seattle: The Port of Seattle plans to create more light industrial/manufacturing space at Terminal 91 in Interbay to support the maritime industry. A higher than usual amount of residents attended the March 19 Magnolia Community Council meeting to hear about the Port of Seattle's proposed changes to Terminal 91. Port of Seattle director of economics Dave McFadden led the presentation and discussed the new developments coming to the terminal, which is under and next to the Magnolia Bridge. The proposal is to eventually build 700,000 square feet of new maritime industrial building space in Terminal 91’s Uplands area. The Port of Seattle Commission approved $4.3 million to begin the planning phase of the project on Feb. 26. Since then McFadden and his employees created a Terminal 91 Uplands infrastructure study, which broke down the proposed project into three phases. Phase 1 will cost the port around $700,000 and include an off-site connection to Seattle's sanitary sewer, a new port electrical transformer and communications pedestals, and a minor natural gas relocation. Phase 2 will cost the port an estimated $5 million and include a new sanitary sewer main sized for a full 1 million square feet of development, a regional stormwater treatment facility and port electrical transformer. Phase 3 is the big-ticket item, estimated to cost $28.3 million. This will include the construction of a central arterial access road and associated utility corridor, a replacement of a 42-foot storm drain main pipe and additional cooling fans to two existing electrical substations to increase site power capacity. The Port of Seattle is working with the city to receive a Major Planned Development permit for up to 15 years of construction. The port is also in the beginning phases of an environmental impact study, which is why it is attending community meetings to take comments and answer questions about the project. The port is currently planning for the first two phases, and expects construction to begin in 2021. McFadden said a project like this has been a long time coming. “We've tried to develop the uplands on several occasions but we couldn't for a few good reasons,” he said. One of the biggest questions the MCC had for McFadden was in regard to the Magnolia Bridge. Many trustees noted that more development would mean more traffic and use of the bridge, which is in need of replacement. “Can the port side with us or embrace the idea of a one-to-one replacement of the bridge?” asked Magnolia Chamber of Commerce president Pat Craft. McFadden did not entirely embrace the idea of supporting the council's plan for a bridge replacement, but said the port will bring up the idea and more during discussions with SDOT, Sound Transit and WSDOT. The port is working with Sound Transit on plans for the new light rail extension through West Seattle and Ballard. McFadden also emphasized the ports plans to make sure the area is used to bring more well paying jobs to Terminal 91 through the construction of industrial space. Seattle Department of Neighborhoods director Andres Mantilla discussed ways he is trying to create more connections and dialogue between the city and Seattle’s communities and councils during last Tuesday’s meeting. Mantilla first started working for the City of Seattle as a part of a community outreach team in 2008. He started working in the Office of Economic Development in 2011. He worked in the private sector before Seattle Mayor Jenny Durkan rehired him to work on another community outreach team. In his new role as DON director, Mantilla has been trying to make inner-city changes, so more residents feel heard. Residents in attendance and trustees had a lot to say to Mantilla about the lack of communication between neighborhood chambers, councils and residents. Mantilla explained that during the creation of the 2014-15 city budget, Mayor Ed Murray took away funding for the past neighborhood councils and decreased the number of staff in the Department of Neighborhoods. Since then there has been little employee growth or budget increases. “The department is 60 people, and the City of Seattle has over 11,000 employees,” Mantilla said. “Even if we had 200 people, we can't own all the outreach. It's slow and frustrating, but I hear what you are saying and it's on us and the city to do better." Ballard District Council director Angie Gerrald attended the MCC meeting and said Ballard residents have many of the same concerns. Mantilla said he is trying to coordinate with his staff and Mayor Jenny Durkan to create quarterly or annual growth reports and have community or neighborhood-specific round tables to answer questions. At the top of the council meeting, MCC president Lynn Hoagan announced trustee Tom Tanner resigned from the council.